Enhance your running performance with proper running form. Whether you are new to running or you’ve been around the block a few times, correct running posture can benefit your running efforts. Although your legs may be the first body part that jumps to your mind when you think of running, pounding the pavement is actually a total body activity. By making a few tweaks to your form, your whole body can work together with correct running posture, and you’ll be able to reap the benefits. 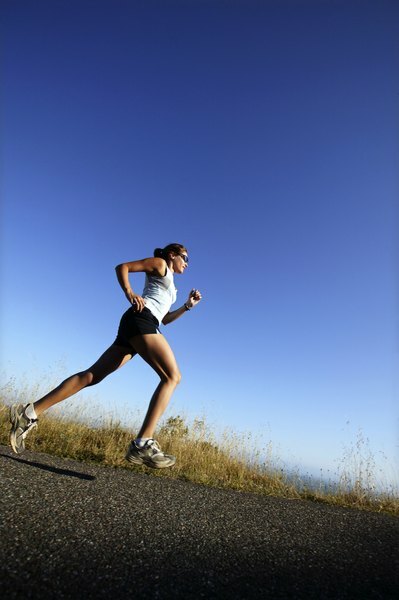 Your head should not be tilted forward or backward when you are running. Keep your eyes gazing naturally out into the horizon ahead with your shoulders relaxed back. Letting your head fall one way or the other restricts your airway or causes shoulders to slouch, both of which make it more difficult to breathe during vigorous exercise. Your arms provide counterbalance to your legs while you are running, reduce the amount of torque on your spine and assist with forward motion. If you think arms aren’t important for running, try sprinting with them straight by your sides and you’ll quickly learn where good arm motion comes into play. Your arms should be bent at your elbow to about 90 degrees and have a freely swinging forward and back motion. Do your best to avoid energy-wasting, side-to-side movements. To prevent excess upper body tension, keep your hands in loose balls with your palms facing inward. As your center of gravity, your hips are the foundation for good running posture. The forward motion of running can have a tendency to make you lean forward from your hips, but doing so can impede stride length and cause lower back pain. Think of your hip region as an upright bucket of water, if you lean too far forward the water will spill out. Counteract a forward hip tilt by engaging your lower abs to roll your pelvis backward and keep it “tucked under." Imagine there is a string that runs along your spine, up through the top of your head. While you are running, imagine someone is pulling up on that string, lifting your torso -- along with you head and neck. This position, known as “running tall," improves lung capacity and stride length. Maintain a natural and comfortable straight back throughout your run by checking in with your form every so often. If you find yourself slouching, take a deep breath and remember the image of someone pulling up on your string. How Do Arms & Legs Coordinate While Running?